Faith in God was never the question for Rosa Parks; it was the answer. All her life she disagreed with novelist James Baldwin’s strident claim that “to be black in America is to live in a constant stage of rage.” The teachings of Jesus Christ had convinced her instead, as they had Martin Luther King, Jr., that a heart filled with love could conquer anything, even bigotry. "From my upbringing and the Bible I learned people should stand up for rights," she recalled, "just as the children of Israel stood up to the Pharaoh." She was educated from the age of eleven at the Montgomery Industrial School for Girls, a progressive school founded at the end of the Civil War by Alice White and Margaret Beard, whose philosophy of education was inspired by Booker T. Washington (1856-1915). Of the school’s strict administration of virtuous behavior, and industry, and thrift Parks is quoted, “We were taught to be ambitious and to believe that we could do what we wanted in life.” Rosa McCauley had ambitions to be a teacher as her mother, but the illness of her grandmother and mother necessitated her to leave school and go to work. This pattern of putting the needs of others above her own remained a constant throughout her long life. "When I declined to give up my seat, it was not that day. Or bus, in particular. I just wanted to be free like everybody else. I did not want to be continually humiliated over something I had no control over: the color of my skin." She was promptly arrested and the rest is history. Her case was taken up by civil rights lawyers, and Baptist ministers Ralph Abernathy (1926-1990) and Martin Luther King Jr. (1929-1968). Her quiet courage gave rise to the Montgomery bus boycott and let to the civil rights movement. Childless herself, Rosa Parks was happily involved with the welfare of youth throughout her life. She wrote the following books, My Story, Quiet Strength and Dear Mrs. Parks: A Dialogue with Today’s Youth. Proceeded in death by her mother, husband and only brother, she spent the final years of her life “at peace” continuing to read from the King James Bible while watching ships pass from her twenty-fifth floor apartment overlooking the Detroit River. She died on October 25, 2005 at the age of ninety-two. 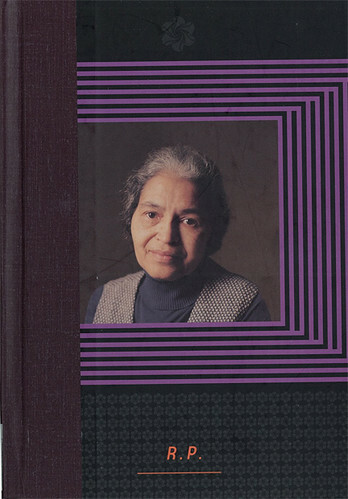 Image from Rosa Parks, Douglas Brinkley, Penguin Group, New York, 2000.